Easily create fantastic mobile-ready CSS-based drop down menus for your website. Many elegant menu templates are available, including modern flat and classic glossy styles. Menus created with Easy CSS Menu Maker are very quick, compact and compatible with both modern and popular, but old web browsers. The menus created with Easy CSS Menu will also work on mobile and touch devices. What is more, they are search engine and SEO friendly. Easily create fantastic mobile-ready CSS-based drop down menus for your website. Many elegant menu templates are available, including modern flat and classic glossy styles. Menus created with Easy CSS Menu Maker are very quick, compact and compatible with both modern and popular, but old web browsers. The menus created with Easy CSS Menu will also work on mobile and touch devices. What is more, they are search engine and SEO friendly. 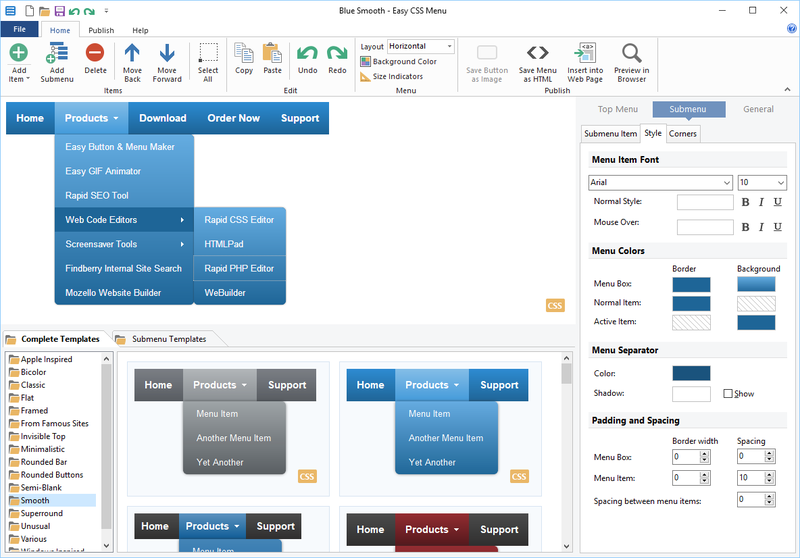 The code generated by Easy CSS Menu Maker is clean and can be easily used by expert web developers while automatic insertion features makes Easy CSS Menu Maker perfectly suitable for beginners. Latest version fully supports modern mobile-read 'hamburger' style menus.